Children Books Baseball | Motivate Your Kids to Read, motivate your kids to read with fun and exciting books. From Kevin Christoforo comes a fun-filled book series about believing in yourself and working as a team that motivates 4-7 year olds to read. 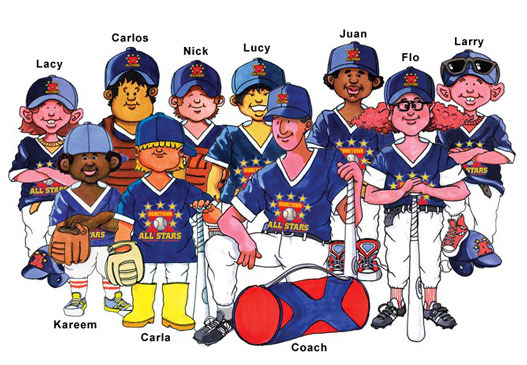 The Hometown All Stars book series follows Nick, the main character and the leader of the team as he and his teammates (both boys and girls) with diverse backgrounds and unique personalities learn to play baseball. You can’t join a team without going through the motions of showing up, seeing your friends, and getting a uniform. The Hometown All Stars books then follow an “age appropriate” progression of learning the steps to play a game and be involved in the community. The Hometown All Stars book series are designed to be short- bed time reading books. You have to learn how to catch, hit and throw before you even think about playing a game. The series that follows covers the typical baseball season and all the fun and education that goes with it. Written for children ages three to five, Kevin wrote The Hometown All Stars as a “bedtime story” to get kids interested in the national pastime again. His goal in writing this book was to get kids out of the house and onto the field – ” less screen, more green.” He believes in the valuable lessons that children learn from playing the game: teamwork, discipline, strategy, and thinking before they act. In addition, he wants to bring back the joy of being outdoors and playing, that kids in recent years have lost. For more information about The Hometown All Stars, please visit https://thehometownallstars.com/. “Like” The Hometown All Stars on Facebook at https://www.facebook.com/TheWoodstockAllStars.